The Shining Men are everywhere. You spot them out of the corner of your eye. Abnormally tall, with long lank hair, blank faces and blazing eyes. If they catch you, they’ll drag you away to who knows where. No one is safe. They’re on every street corner. Waiting. Watching. Shining bright. The year is 1645, and Edinburgh is in the grip of the worst plague in its history. Nobody knows who will be the next to succumb – nobody except the Night Doctor, a masked figure that stalks the streets, seeking out those who will not live to see another day. But death is not the end. The Doctor, Bill and Nardole discover that the living are being haunted by the recently departed – by ghosts that do not know they are dead. And there are other creatures lurking in the shadows, slithering, creeping creatures filled with an insatiable hunger. For over fifteen years the crew of Kollo-Zarnista Mining Facility 27 has been extracting diamonds from deep within the atmosphere of Saturn, diamonds that help to fund the ever-expanding Human Empire. But when a mining operation goes wrong, a rescue mission must be launched to save a worker lost overboard, a worker who claims that he has seen something amongst the swirling clouds. Something that can’t possibly exist. 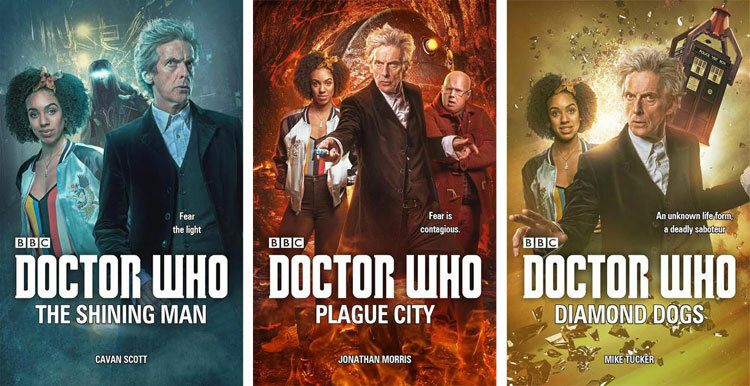 All three novels feature the Twelfth Doctor, as played by Peter Capaldi, and Bill, as played by Pearl Mackie. They are out now, published by Penguin and can be ordered from Forbidden Planet and all good book stores. Forbidden Planet are also hosting a signing at their Bristol Store, Saturday 22nd April 2017, you can find more information here.